I've always had a sneaking suspicion that anti-smoking ads are the work of tobacco companies. There is one I've seen in a few bar and restaurant bathrooms around Vancouver. It has two photographs - one pictures two buddies sitting around in a park on Canada Day 2005, smoking, and the second shows them pudgy faced on mountain bikes for Canada Day 2006. This ad makes me want to smoke, and I am a non-smoker. I can't imagine what it would do to someone who is trying to quit. It's kind of scary actually. When cigarette companies were banned from television advertising in the States in 1971 the stations immediately lost $220 million a year in advertising revenue. They did, eventually, recoup this loss through advertising quitting smoking products. Now, anti-smoking ads pay more than that to stations. 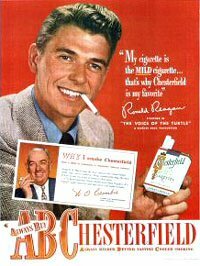 Here is an old ad featuring none other than Ronald Reagan.